Jiho Sargent was a technical writer and editor, proofreader, programming expert, and a SWET stalwart for more than two decades. She was also a Buddhist priest who served for a time at Taisoji near Sugamo station. Her health took a turn for the worse in 2006, however, and she decided to return to the United States to live with her daughter. The following article, which appeared in the SWET Newsletter in September 2000, reveals Jiho as someone with an awesome résumé of accomplishments and a mind-boggling talent for learning how to learn. She described her life’s journey as “moving with the flow of worldly transience,” but friends and those she mentored will always remember that it was guided by a firm sense of purpose and generosity of spirit. She died in Eugene, Oregon, on June 17, 2009. The photograph accompanying this article was taken for Sargent’s book, 108 Answers: Asking About Zen (Weatherhill 2001). SWET seeks permission from the photographer for use of this photograph in SWET publications. Please use our online form to contact the editor of the SWET Newsletter. Looking back on how I came to be in Tokyo as a Buddhist priest who does freelance editing, it seems there has never been a time when I planned a progression and accomplished it. Everything just arose from the circumstances—a good example of the Buddhist teaching about the interwoven being of all phenomena. The first step on this path probably was a remark over coffee and donuts one October morning in 1956. Several women were chatting after delivering our children to a morning play group for those, like my son and daughter, who lacked preschool companions near their homes in the Los Angeles suburbs. I happened to sigh that I needed a part-time job to pay off medical bills (this being before widespread medical insurance). Another mother said her husband worked right across the street at an electronics company and had told her they were looking for a blueprint clerk. That sounded possible: my father had opened a radio and television repair shop when I started high school, and I had helped out there enough to recognize electronic parts names. Within a week, I was busily making lists of drawings to be blueprinted, “part-time” at forty-eight hours a week. Less than a month was needed to convince me that I did not want a career in blueprinting. Dropping out of college after my junior year as a music major had not prepared me for anything else, though. I looked around the company at other employees. Engineers and technical writers seemed to have more-interesting jobs. Taking up engineering seemed a long, hard course, but the technical writers’ job appeared more approachable. I asked what the requirements were; none, they said, as far as they had ever noticed. (In fact, five of the six had engineering degrees, and the other had a degree in English.) So a campaign started to get me transferred to technical writing. That turned out to be so much fun that I am still doing it from time to time. This start was great good fortune because the other writers were unusually well experienced and willing to share their knowledge. I could not have asked for a better set of trainers! Even my introduction to the word “discrete” (I had wondered aloud what a circuit had to be “discreet” about!) was accepted as a good joke. In addition, I enrolled in a basic electronics course at a junior college nearby to acquire a minimal understanding of the equipment I wrote about. The volatility of the aerospace industry led my first employer into decline and sent me through a series of short jobs after that. The next steps were taken at a rocket motor development company. I had been hired to write instruction manuals and project reports, and after a while was also assigned to write a monthly in-house newsletter. When a manager was hired for writing new business proposals, I was asked to help him. After two days it was clear he had no idea how to start or what to do. The new manager abruptly became the ex-manager, and I became the sole writer-editor on the proposal team, which involved a half-dozen engineers and a pair of accountants. Even for this rather small development job, the government agency needing the rockets specified what topics must be addressed in the technical, management, and financial sections; specified the maximum number of pages (and the minimum type size! ); set an effective starting date by issuing their request for proposal; and set the date and time at which all submitted proposals would be simultaneously opened for evaluation. It was not the way I would choose to learn a new job, but it certainly was challenging. Shortly afterward, the company hired another proposal manager and created a technical publications department, once more giving me more-experienced fellow workers from whom to learn. In 1961, one of my colleagues from my first job hired me in the publications department of a Lockheed division with contracts ranging from aircraft servicing and maintenance, through making flight data and voice recorders (the two “black boxes” sought after a crash), to checking species diversity changes near the cooling water outlets of nuclear power plants. Most of the technical writers preferred to specialize in one product line, so I was given “everything else,” a post that proved a source of fascinating information. When a time-sharing computer service was installed, I was assigned to learn how to use it, then pass the information along to the rest of my department. (By this time, I was part of the research and development department.) That was my first involvement with computers. I found them more fun than Christmas! After the in-house course, I took courses in Basic programming languages and in business systems analysis, both given on Saturdays by a university extension center. Southern California was, and still seems to be, remarkably blessed with opportunities for continuing education in every field. Having gotten back into the swing of schooling, when work slowed down a little I decided to try finishing up a B.A. The Pomona campus of California State Polytechnic University was conveniently located between my home and workplace, so I enrolled there in the language arts department as a journalism major (the closest thing to technical writing then available). A year later I graduated with a bachelor of science degree. (I have never known why language arts was considered an area of science.) An English literature professor had asked me to recommend a technical writing textbook for a course required of all engineering students. I looked at many, but they all seemed to concentrate on research papers rather than the everyday writing work of young engineers. So, for my undergraduate thesis, I wrote a more directly useful text, which was published two years later by Kendall-Hunt. With incredible bravery, the professor who had asked my advice ended up teaching a course with my material while I was writing it. Most of the time, I was only a week or so ahead of her! All this led to my being asked to teach the course myself, as a part-time lecturer. Lockheed was cooperative, so I was able to accept. Being on the faculty meant attending the university’s graduation ceremonies, and I didn’t want to be one of the handful of people in bachelors’ robes while almost everyone else wore doctors’ hoods. I promptly enrolled in an MBA course taught in the evening, designed to attract aerospace personnel. Partway through the course, I took a year off from study to install a computer system I had designed for Lockheed at ANA’s Haneda airport maintenance facility and to complete its software there. The “crash data recorders” that are read only after an incident or accident in the United States are required to be read routinely in Japan. The computer system automated checking of the tapes. Not long after graduating with an MBA, I accepted an offer to become part of an organization for new business proposals at Lockheed Missiles and Space, in the San Francisco Bay area. Once more I was given the opportunity to learn a little about dozens of rather esoteric subjects. Proposal work, however, is notoriously wearing on the workers, with eighty-hour weeks common near the deadline date. (And if the deadline is missed by even a minute, several million dollars of company funds will have been totally wasted.) Late in 1978, I asked for a year’s leave of absence to study Sōtōshū Zen in Japan. My earlier ten months in Tokyo had let me observe that English-language technical writers and editors were in short supply and great demand. It was easy to obtain freelance work I could do at home, on my own schedule. Before the year of leave time was over, I had a contract to work exclusively for one translation agency and receive a monthly salary. That month-by-month contract continued fourteen years, and I still do some freelance work for the same company. My years of learning how to learn paid off when I was faced all alone with a milling and boring machine manual one month and a journal paper on LSI fabrication the next. Before the leave year was over, I also had established a zazen room in my tiny Tokyo apartment. 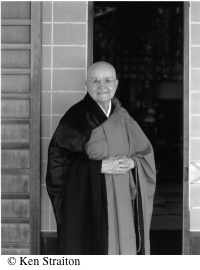 The bilingual priest of a “Zen center,” created by a Japanese woman in a former boutique, left the center to devote full time to his own temple in Shizuoka-ken only five months after I had begun participation in the center. His replacement spoke only Japanese, so the founder decided all non-Japanese would have to find another place for their Zen practice. I offered to share my zazen time at home with anyone who wished to join me. Perhaps stunned by the sudden eviction from the center’s activities, I did not pause to realize that in doing so I became the de facto leader. When that fact finally dawned on me (a Zen awakening? ), I decided to seek training for the job. In this case, there was no handy extension course to take and no thought of going back to Lockheed. The way to learning was entry into the Sōtōshū priesthood as a trainee. After ten years of training as nonstandard as my other efforts had been, I was accredited as a full priest. I could never have dreamed of a journey nearly as interesting as the one I have ridden, and continue to ride, moving with the flow of worldly transience. Originally published in the SWET Newsletter, No. 90 (September 2000), pp. 20-23.